Chinese martial arts, often named under the umbrella terms kung fu (/ˈkʊŋ ˈfuː/; Chinese: 功夫; pinyin: gōngfu; Cantonese Yale: gūng fū) and wushu (武術; wǔshù), are the several hundred fighting styles that have developed over the centuries in China. These fighting styles are often classified according to common traits, identified as "families" (家; jiā), "sects" (派; pài) or "schools" (門; mén) of martial arts. Examples of such traits include Shaolinquan (少林拳) physical exercises involving Five Animals (五形) mimicry, or training methods inspired by Old Chinese philosophies, religions and legends. Styles that focus on qi manipulation are called internal (内家拳; nèijiāquán), while others that concentrate on improving muscle and cardiovascular fitness are called "external" (外家拳; wàijiāquán). Geographical association, as in northern (北拳; běiquán) and "southern" (南拳; nánquán), is another popular classification method. Kung fu and wushu are loanwords from Cantonese and Mandarin respectively that, in English, are used to refer to Chinese martial arts. However, the Chinese terms kung fu and wushu ( listen (Mandarin) (help·info); Cantonese Yale: móuh seuht) have distinct meanings. The Chinese equivalent of the term "Chinese martial arts" would be Zhongguo wushu (Chinese: 中國武術; pinyin: zhōngguó wǔshù) (Mandarin). Wǔshù literally means "martial art". It is formed from the two words 武術: 武 (wǔ), meaning "martial" or "military" and 術 or 术 (shù), which translates into "art", "discipline", "skill" or "method". The term wushu has also become the name for the modern sport of wushu, an exhibition and full-contact sport of bare-handed and weapons forms (Chinese: 套路), adapted and judged to a set of aesthetic criteria for points developed since 1949 in the People's Republic of China. Quanfa (拳法) is another Chinese term for Chinese martial arts. It means "fist method" or "the law of the fist" (quan means "boxing" or "fist", and fa means "law", "way" or "method"), although as a compound term it usually translates as "boxing" or "fighting technique." The name of the Japanese martial art kempō is represented by the same hanzi characters. Detailed knowledge about the state and development of Chinese martial arts became available from the Nanjing decade (1928–1937), as the Central Guoshu Institute established by the Kuomintang regime made an effort to compile an encyclopedic survey of martial arts schools. Since the 1950s, the People's Republic of China has organized Chinese martial arts as an exhibition and full-contact sport under the heading of “wushu”. The earliest references to Chinese martial arts are found in the Spring and Autumn Annals (5th century BCE), where a hand-to-hand combat theory, one that integrates notions of "hard" and "soft" techniques, is mentioned. A combat wrestling system called juélì or jiǎolì (角力) is mentioned in the Classic of Rites. This combat system included techniques such as strikes, throws, joint manipulation, and pressure point attacks. Jiao Di became a sport during the Qin Dynasty (221–207 BCE). The Han History Bibliographies record that, by the Former Han (206 BCE – 8 CE), there was a distinction between no-holds-barred weaponless fighting, which it calls shǒubó (手搏), for which training manuals had already been written, and sportive wrestling, then known as juélì (角力). Wrestling is also documented in the Shǐ Jì, Records of the Grand Historian, written by Sima Qian (ca. 100 BCE). The ideas associated with Chinese martial arts changed with the evolution of Chinese society and over time acquired some philosophical bases: Passages in the Zhuangzi (庄子), a Daoist text, pertain to the psychology and practice of martial arts. Zhuangzi, its eponymous author, is believed to have lived in the 4th century BCE. The Dao De Jing, often credited to Lao Zi, is another Taoist text that contains principles applicable to martial arts. According to one of the classic texts of Confucianism, Zhou Li (周禮/周礼), Archery and charioteering were part of the "six arts" (simplified Chinese: 六艺; traditional Chinese: 六藝; pinyin: liu yi, including rites, music, calligraphy and mathematics) of the Zhou Dynasty (1122–256 BCE). The Art of War (孫子兵法), written during the 6th century BCE by Sun Tzu (孫子), deals directly with military warfare but contains ideas that are used in the Chinese martial arts. Daoist practitioners have been practicing Tao Yin (physical exercises similar to Qigong that was one of the progenitors to T'ai chi ch'uan) from as early as 500 BCE. In 39–92 CE, "Six Chapters of Hand Fighting", were included in the Han Shu (history of the Former Han Dynasty) written by Pan Ku. Also, the noted physician, Hua Tuo, composed the "Five Animals Play"—tiger, deer, monkey, bear, and bird, around 220 CE. Daoist philosophy and their approach to health and exercise have influenced the Chinese martial arts to a certain extent. Direct reference to Daoist concepts can be found in such styles as the "Eight Immortals," which uses fighting techniques attributed to the characteristics of each immortal. In 495 AD, Shaolin temple was built in the Song mountain, Henan province. The first monk who preached Buddhism there was the Indian monk named Buddhabhadra (佛陀跋陀罗; Fótuóbátuóluó), simply called Batuo (跋陀) by the Chinese. There are historical records that Batuo's first Chinese disciples, Huiguang (慧光) and Sengchou (僧稠), both had exceptional martial skills. For example, Sengchou's skill with the tin staff is even documented in the Chinese Buddhist canon. After Buddhabadra, another Indian specifically Western South Indian monk, Bodhidharma (菩提达摩; Pútídámó), simply called Damo (达摩) by the Chinese, came to Shaolin in 527 AD. His Chinese disciple, Huike (慧可), was also a highly trained martial arts expert. There are implications that these first three Chinese Shaolin monks, Huiguang, Sengchou, and Huike, may have been military men before entering the monastic life. Between the 16th and 17th centuries, at least forty sources exist to provide evidence both that monks of Shaolin practiced martial arts, and that martial practice became an integral element of Shaolin monastic life. The earliest appearance of the frequently cited legend concerning Bodhidharma's supposed foundation of Shaolin Kung Fu dates to this period. The origin of this legend has been traced to the Ming period's Yijin Jing or "Muscle Change Classic", a text written in 1624 attributed to Bodhidharma. References of martial arts practice in Shaolin appear in various literary genres of the late Ming: the epitaphs of Shaolin warrior monks, martial-arts manuals, military encyclopedias, historical writings, travelogues, fiction and poetry. However these sources do not point out to any specific style originated in Shaolin. These sources, in contrast to those from the Tang period, refer to Shaolin methods of armed combat. These include a skill for which Shaolin monks became famous: the staff (gùn, Cantonese gwan). The Ming General Qi Jiguang included description of Shaolin Quan Fa (Chinese: 少林拳法; Wade–Giles: Shao Lin Ch'üan Fa; literally: 'Shaolin fist technique'; Japanese: Shorin Kempo) and staff techniques in his book, Ji Xiao Xin Shu (紀效新書), which can translate as New Book Recording Effective Techniques. When this book spread to East Asia, it had a great influence on the development of martial arts in regions such as Okinawa and Korea. The present view of Chinese martial arts are strongly influenced by the events of the Republican Period (1912–1949). In the transition period between the fall of the Qing Dynasty as well as the turmoil of the Japanese invasion and the Chinese Civil War, Chinese martial arts became more accessible to the general public as many martial artists were encouraged to openly teach their art. At that time, some considered martial arts as a means to promote national pride and build a strong nation. As a result, many training manuals (拳谱) were published, a training academy was created, two national examinations were organized and demonstration teams travelled overseas. Numerous martial arts associations were formed throughout China and in various overseas Chinese communities. The Central Guoshu Academy (Zhongyang Guoshuguan, 中央國術館/中央国术馆) established by the National Government in 1928 and the Jing Wu Athletic Association (精武體育會/精武体育会) founded by Huo Yuanjia in 1910 are examples of organizations that promoted a systematic approach for training in Chinese martial arts. A series of provincial and national competitions were organized by the Republican government starting in 1932 to promote Chinese martial arts. In 1936, at the 11th Olympic Games in Berlin, a group of Chinese martial artists demonstrated their art to an international audience for the first time. The term kuoshu (or guoshu, 國術 meaning "national art"), rather than the colloquial term gongfu was introduced by the Kuomintang in an effort to more closely associate Chinese martial arts with national pride rather than individual accomplishment. Chinese martial arts experienced rapid international dissemination with the end of the Chinese Civil War and the founding of the People's Republic of China on October 1, 1949. Many well known martial artists chose to escape from the PRC's rule and migrate to Taiwan, Hong Kong, and other parts of the world. Those masters started to teach within the overseas Chinese communities but eventually they expanded their teachings to include people from other ethnic groups. 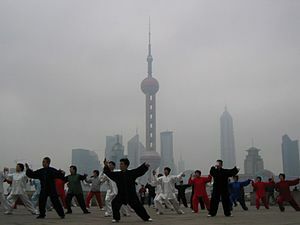 Within China, the practice of traditional martial arts was discouraged during the turbulent years of the Chinese Cultural Revolution (1969–1976). Like many other aspects of traditional Chinese life, martial arts were subjected to a radical transformation by the People's Republic of China to align them with Maoist revolutionary doctrine. The PRC promoted the committee-regulated sport of Wushu as a replacement for independent schools of martial arts. This new competition sport was disassociated from what was seen as the potentially subversive self-defense aspects and family lineages of Chinese martial arts. In 1958, the government established the All-China Wushu Association as an umbrella organization to regulate martial arts training. The Chinese State Commission for Physical Culture and Sports took the lead in creating standardized forms for most of the major arts. During this period, a national Wushu system that included standard forms, teaching curriculum, and instructor grading was established. Wushu was introduced at both the high school and university level. The suppression of traditional teaching was relaxed during the Era of Reconstruction (1976–1989), as Communist ideology became more accommodating to alternative viewpoints. In 1979, the State Commission for Physical Culture and Sports created a special task force to reevaluate the teaching and practice of Wushu. In 1986, the Chinese National Research Institute of Wushu was established as the central authority for the research and administration of Wushu activities in the People's Republic of China. Chinese martial arts are an integral element of 20th-century Chinese popular culture. Wuxia or "martial arts fiction" is a popular genre that emerged in the early 20th century and peaked in popularity during the 1960s to 1980s. Wuxia films were produced from the 1920s. The Kuomintang suppressed wuxia, accusing it of promoting superstition and violent anarchy. Because of this, wuxia came to flourish in British Hong Kong, and the genre of kung fu movie in Hong Kong action cinema became wildly popular, coming to international attention from the 1970s. The genre underwent a drastic decline in the late 1990s as the Hong Kong film industry was crushed by economic depression. In the wake of Crouching Tiger, Hidden Dragon (2000), there has been somewhat of a revival of Chinese-produced wuxia films aimed at an international audience, including Hero (2002), House of Flying Daggers (2004) and Reign of Assassins (2010). China has a long history of martial arts traditions that includes hundreds of different styles. Over the past two thousand years, many distinctive styles have been developed, each with its own set of techniques and ideas. There are also common themes to the different styles, which are often classified by "families" (家; jiā), "sects" (派; pai) or "schools" (門; men). There are styles that mimic movements from animals and others that gather inspiration from various Chinese philosophies, myths and legends. Some styles put most of their focus into the harnessing of qi, while others concentrate on competition. Chinese martial arts can be split into various categories to differentiate them: For example, external (外家拳) and internal (内家拳). Chinese martial arts can also be categorized by location, as in northern (北拳) and southern (南拳) as well, referring to what part of China the styles originated from, separated by the Yangtze River (Chang Jiang); Chinese martial arts may even be classified according to their province or city. The main perceived difference between northern and southern styles is that the northern styles tend to emphasize fast and powerful kicks, high jumps and generally fluid and rapid movement, while the southern styles focus more on strong arm and hand techniques, and stable, immovable stances and fast footwork. Examples of the northern styles include changquan and xingyiquan. Examples of the southern styles include Bak Mei, Wuzuquan, Choy Li Fut, and Wing Chun. Chinese martial arts can also be divided according to religion, imitative-styles (象形拳), and family styles such as Hung Gar (洪家). There are distinctive differences in the training between different groups of the Chinese martial arts regardless of the type of classification. However, few experienced martial artists make a clear distinction between internal and external styles, or subscribe to the idea of northern systems being predominantly kick-based and southern systems relying more heavily on upper-body techniques. Most styles contain both hard and soft elements, regardless of their internal nomenclature. Analyzing the difference in accordance with yin and yang principles, philosophers would assert that the absence of either one would render the practitioner's skills unbalanced or deficient, as yin and yang alone are each only half of a whole. If such differences did once exist, they have since been blurred. Stances (steps or 步法) are structural postures employed in Chinese martial arts training. They represent the foundation and the form of a fighter's base. Each style has different names and variations for each stance. Stances may be differentiated by foot position, weight distribution, body alignment, etc. Stance training can be practiced statically, the goal of which is to maintain the structure of the stance through a set time period, or dynamically, in which case a series of movements is performed repeatedly. The Horse stance (骑马步/马步; qí mǎ bù/mǎ bù) and the bow stance are examples of stances found in many styles of Chinese martial arts. The concept of qi or ch'i (氣/气) is encountered in a number of Chinese martial arts. Qi is variously defined as an inner energy or "life force" that is said to animate living beings; as a term for proper skeletal alignment and efficient use of musculature (sometimes also known as fa jin or jin); or as a shorthand for concepts that the martial arts student might not yet be ready to understand in full. These meanings are not necessarily mutually exclusive. [note 1] The existence of qi as a measurable form of energy as discussed in traditional Chinese medicine has no basis in the scientific understanding of physics, medicine, biology or human physiology. There are many ideas regarding the control of one's qi energy to such an extent that it can be used for healing oneself or others. Some styles believe in focusing qi into a single point when attacking and aim at specific areas of the human body. Such techniques are known as dim mak and have principles that are similar to acupressure. Application refers to the practical use of combative techniques. Chinese martial arts techniques are ideally based on efficiency and effectiveness. Application includes non-compliant drills, such as Pushing Hands in many internal martial arts, and sparring, which occurs within a variety of contact levels and rule sets. When and how applications are taught varies from style to style. Today, many styles begin to teach new students by focusing on exercises in which each student knows a prescribed range of combat and technique to drill on. These drills are often semi-compliant, meaning one student does not offer active resistance to a technique, in order to allow its demonstrative, clean execution. In more resisting drills, fewer rules apply, and students practice how to react and respond. 'Sparring' refers to the most important aspect of application training, which simulates a combat situation while including rules that reduce the chance of serious injury. Competitive sparring disciplines include Chinese kickboxing Sǎnshǒu (散手) and Chinese folk wrestling Shuāijiāo (摔跤), which were traditionally contested on a raised platform arena Lèitái (擂台). Lèitái represents public challenge matches that first appeared in the Song Dynasty. The objective for those contests was to knock the opponent from a raised platform by any means necessary. San Shou represents the modern development of Lei Tai contests, but with rules in place to reduce the chance of serious injury. Many Chinese martial art schools teach or work within the rule sets of Sanshou, working to incorporate the movements, characteristics, and theory of their style. Chinese martial artists also compete in non-Chinese or mixed Combat sport, including boxing, kickboxing and Mixed martial arts. Forms or taolu (Chinese: 套路; pinyin: tàolù) in Chinese are series of predetermined movements combined so they can be practiced as a continuous set of movements. Forms were originally intended to preserve the lineage of a particular style branch, and were often taught to advanced students selected for that purpose. Forms contained both literal, representative and exercise-oriented forms of applicable techniques that students could extract, test, and train in through sparring sessions. Today, many consider taolu to be one of the most important practices in Chinese martial arts. Traditionally, they played a smaller role in training for combat application, and took a back seat to sparring, drilling, and conditioning. Forms gradually build up a practitioner's flexibility, internal and external strength, speed and stamina, and they teach balance and coordination. Many styles contain forms that use weapons of various lengths and types, using one or two hands. Some styles focus on a certain type of weapon. Forms are meant to be both practical, usable, and applicable as well as to promote fluid motion, meditation, flexibility, balance, and coordination. Teachers are often heard to say "train your form as if you were sparring and spar as if it were a form." There are two general types of taolu in Chinese martial arts. Most common are solo forms performed by a single student. There are also sparring forms — choreographed fighting sets performed by two or more people. Sparring forms were designed both to acquaint beginning fighters with basic measures and concepts of combat, and to serve as performance pieces for the school. Weapons-based sparring forms are especially useful for teaching students the extension, range, and technique required to manage a weapon. The term taolu (套路) is a shorten version of Tao Lu Yun Dong (套路運動), an expression introduced only recently with the popularity of modern wushu. This expression refers to “exercise sets” and is used in the context of athletics or sport. lian quan tao (練拳套) – practicing sequence of fist. lian quan jiao (練拳腳) – practicing fists and feet. lian bing qi (練兵器) – practicing weapons. dui da (對打) and dui lian (對練) – fighting sets. Traditional "sparring" sets, called dui da (對打) or dui lian (對練), were an important part of Chinese martial arts for centuries. Dui lian literally means, to train by a pair of combatants opposing each other—the character lian (練), means to practice; to train; to perfect one's skill; to drill. As well, often one of these terms are also included in the name of fighting sets (雙演; shuang yan), "paired practice" (掙勝; zheng sheng), "to struggle with strength for victory" (敵; di), match – the character suggests to strike an enemy; and "to break" (破; po). Generally there are 21, 18, 12, 9 or 5 drills or 'exchanges/groupings' of attacks and counterattacks, in each dui lian set. These drills were considered only generic patterns and never meant to be considered inflexible 'tricks'. Students practiced smaller parts/exchanges, individually with opponents switching sides in a continuous flow. Basically, dui lian were not only a sophisticated and effective methods of passing on the fighting knowledge of the older generation, they were important and effective training methods. The relationship between single sets and contact sets is complicated, in that some skills cannot be developed with single sets, and, conversely, with dui lian. Unfortunately, it appears that most traditional combat oriented dui lian and their training methodology have disappeared, especially those concerning weapons. There are a number of reasons for this. In modern Chinese martial arts most of the dui lian are recent inventions designed for light props resembling weapons, with safety and drama in mind. The role of this kind of training has degenerated to the point of being useless in a practical sense, and, at best, is just performance. By the early Song period, sets were not so much "individual isolated technique strung together" but rather were composed of techniques and counter technique groupings. It is quite clear that "sets" and "fighting (2 person) sets" have been instrumental in TCM for many hundreds of years—even before the Song Dynasty. There are images of two person weapon training in Chinese stone painting going back at least to the Eastern Han Dynasty. According to what has been passed on by the older generations, the approximate ratio of contact sets to single sets was approximately 1:3. In other words, about 30% of the sets practiced at Shaolin were contact sets, dui lian, and two person drill training. This is, in part, evidenced by the Qing Dynasty mural at Shaolin. For most of its history, Shaolin martial arts was largely weapon-focused: staves were used to defend the monastery, not bare hands. Even the more recent military exploits of Shaolin during the Ming and Qing Dynasties involved weapons. According to some traditions, monks first studied basics for one year and were then taught staff fighting so that they could protect the monastery. Although wrestling has been as sport in China for centuries, weapons have been the most important part of Chinese wushu since ancient times. If one wants to talk about recent or 'modern' developments in Chinese martial arts (including Shaolin for that matter), it is the over-emphasis on bare hand fighting. During the Northern Song Dynasty (976- 997 A.D) when platform fighting known as Da Laitai (Title Fights Challenge on Platform) first appeared, these fights were with only swords and staves. Although later, when bare hand fights appeared as well, it was the weapons events that became the most famous. These open-ring competitions had regulations and were organized by government organizations; some were also organized by the public. The government competitions resulted in appointments to military posts for winners and were held in the capital as well as in the prefectures. 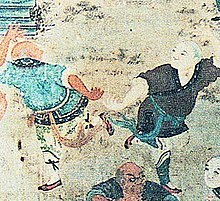 Even though forms in Chinese martial arts are intended to depict realistic martial techniques, the movements are not always identical to how techniques would be applied in combat. Many forms have been elaborated upon, on the one hand to provide better combat preparedness, and on the other hand to look more aesthetically pleasing. One manifestation of this tendency toward elaboration beyond combat application is the use of lower stances and higher, stretching kicks. These two maneuvers are unrealistic in combat and are used in forms for exercise purposes. Many modern schools have replaced practical defense or offense movements with acrobatic feats that are more spectacular to watch, thereby gaining favor during exhibitions and competitions. [note 2] This has led to criticisms by traditionalists of the endorsement of the more acrobatic, show-oriented Wushu competition. Historically forms were often performed for entertainment purposes long before the advent of modern Wushu as practitioners have looked for supplementary income by performing on the streets or in theaters. Documentation in ancient literature during the Tang Dynasty (618–907) and the Northern Song Dynasty (960–1279) suggests some sets, (including two + person sets: dui da also called dui lian) became very elaborate and 'flowery', many mainly concerned with aesthetics. During this time, some martial arts systems devolved to the point that they became popular forms of martial art storytelling entertainment shows. This created an entire category of martial arts known as Hua Fa Wuyi. During the Northern Song period, it was noted by historians this type of training had a negative influence on training in the military. Many traditional Chinese martial artists, as well as practitioners of modern sport combat, have become critical of the perception that forms work is more relevant to the art than sparring and drill application, while most continue to see traditional forms practice within the traditional context—as vital to both proper combat execution, the Shaolin aesthetic as art form, as well as upholding the meditative function of the physical art form. Another reason why techniques often appear different in forms when contrasted with sparring application is thought by some to come from the concealment of the actual functions of the techniques from outsiders. Forms practice is mostly known for teaching combat techniques yet when practicing forms, the practitioner focuses on posture, breathing, and performing the techniques of both right and left sides of the body also develop both hemispheres of the brain and contributes to improved motor skills, forms practice also trains the muscles to execute many complex techniques of the art (muscle memory) and can improve balance, flexibility, and the cardiovascular system. The word wu (武; wǔ) means ‘martial’. Its Chinese character is made of two parts; the first meaning “walk” or “stop” (止; zhǐ) and the second meaning “lance” (戈; gē). This implies that “wu’ 武,” is a defensive use of combat. [dubious – discuss] The term “wushu 武術” meaning 'martial arts' goes back as far as the Liang Dynasty (502-557) in an anthology compiled by Xiao Tong (蕭通), (Prince Zhaoming; 昭明太子 d. 531), called Selected Literature (文選; Wénxuǎn). The term is found in the second verse of a poem by Yan Yanzhi titled: 皇太子釋奠會作詩 "Huang Taizi Shidian Hui Zuoshi". "The great man grows the many myriad things . . . He promotes fully the cultural mandates." The earliest term for 'martial arts' can be found in the Han History (206BC-23AD) was "military fighting techniques" (兵技巧; bīng jìqiǎo). During the Song period (c.960) the name changed to "martial arts" (武艺; wǔyì). In 1928 the name was changed to "national arts" (国术; guóshù) when the National Martial Arts Academy was established in Nanjing. The term reverted to wǔshù under the People's Republic of China during the early 1950s. As forms have grown in complexity and quantity over the years, and many forms alone could be practiced for a lifetime, modern styles of Chinese martial arts have developed that concentrate solely on forms, and do not practice application at all. These styles are primarily aimed at exhibition and competition, and often include more acrobatic jumps and movements added for enhanced visual effect compared to the traditional styles. Those who generally prefer to practice traditional styles, focused less on exhibition, are often referred to as traditionalists. Some traditionalists consider the competition forms of today's Chinese martial arts as too commercialized and losing much of their original values. Traditional Chinese schools of martial arts, such as the famed Shaolin monks, often dealt with the study of martial arts not just as a means of self-defense or mental training, but as a system of ethics. Wude (武 德) can be translated as "martial morality" and is constructed from the words wu (武), which means martial, and de (德), which means morality. Wude deals with two aspects; "morality of deed" and "morality of mind". Morality of deed concerns social relations; morality of mind is meant to cultivate the inner harmony between the emotional mind (心; Xin) and the wisdom mind (慧; Hui). The ultimate goal is reaching "no extremity" (無 極; Wuji) – closely related to the Taoist concept of wu wei – where both wisdom and emotions are in harmony with each other. Yang Luchan (1799–1872) was an important teacher of the internal martial art known as t'ai chi ch'uan in Beijing during the second half of the 19th century. Yang is known as the founder of Yang-style t'ai chi ch'uan, as well as transmitting the art to the Wu/Hao, Wu and Sun t'ai chi families. Ten Tigers of Canton (late 19th century) was a group of ten of the top Chinese martial arts masters in Guangdong (Canton) towards the end of the Qing Dynasty (1644–1912). Wong Kei-Ying, Wong Fei Hung's father, was a member of this group. Ip Man (1893–1972) was a master of the Wing Chun and the first to teach this style openly. Yip Man was the teacher of Bruce Lee. Most major branches of Wing Chun taught in the West today were developed and promoted by students of Yip Man. Jackie Chan (b. 1954) is the famous Hong Kong martial artist, film actor, stuntman, action choreographer, director and producer, and a global pop culture icon, widely known for injecting physical comedy into his martial arts performances, and for performing complex stunts in many of his films. Martial arts influences can also be found in dance, theater  and especially Chinese opera, of which Beijing opera is one of the best-known examples. This popular form of drama dates back to the Tang Dynasty and continues to be an example of Chinese culture. Some martial arts movements can be found in Chinese opera and some martial artists can be found as performers in Chinese operas. In modern times, Chinese martial arts have spawned the genre of cinema known as the Kung fu film. The films of Bruce Lee were instrumental in the initial burst of Chinese martial arts' popularity in the West in the 1970s. Bruce Lee was the iconic international superstar that popularized Chinese martial arts in the West with his own variation of Chinese martial arts called Jeet Kune Do. It is a hybrid style of martial art that Bruce Lee practiced and mastered. Jeet Kune Do is his very own unique style of martial art that uses little to minimum movement but maximizes the effect to his opponents. The influence of Chinese martial art have been widely recognized and have a global appeal in Western cinemas starting off with Bruce Lee. Martial artists and actors such as Jet Li and Jackie Chan have continued the appeal of movies of this genre. Jackie Chan successfully brought in a sense of humour in his fighting style in his movies. Martial arts films from China are often referred to as "kung fu movies" (功夫片), or "wire-fu" if extensive wire work is performed for special effects, and are still best known as part of the tradition of kung fu theater. (see also: wuxia, Hong Kong action cinema). The talent of these individuals have broadened Hong Kong's cinematography production and rose to popularity overseas, influencing Western cinemas. ^ Jamieson, John; Tao, Lin; Shuhua, Zhao (2002). Kung Fu (I): An Elementary Chinese Text. The Chinese University Press. ISBN 978-962-201-867-9. ^ Price, Monroe (2008). Owning the Olympics: Narratives of the New China. Chinese University of Michigan Press. p. 309. ISBN 978-0-472-07032-9. ^ a b c d Fu, Zhongwen (2006) . Mastering Yang Style Taijiquan. Louis Swaine. Berkeley, California: Blue Snake Books. ISBN 1-58394-152-5. ^ Van de Ven, Hans J. (October 2000). Warfare in Chinese History. Brill Academic Publishers. p. 328. ISBN 90-04-11774-1. ^ Graff, David Andrew; Robin Higham (March 2002). A Military History of China. Westview Press. pp. 15–16. ISBN 0-8133-3990-1. Peers, C.J. (2006-06-27). Soldiers of the Dragon: Chinese Armies 1500 BC–1840 AD. Osprey Publishing. p. 130. ISBN 1-84603-098-6. ^ Green, Thomas A. (2001). Martial arts of the world: an encyclopedia. ABC-CLIO. pp. 26–39. ISBN 978-1-57607-150-2. ^ Bonnefoy, Yves (1993-05-15). Asian Mythologies. trans. Wendy Doniger. University Of Chicago Press. p. 246. ISBN 0-226-06456-5. ^ Zhongyi, Tong; Cartmell, Tim (2005). 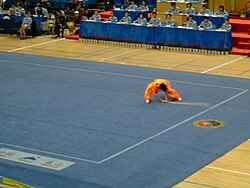 The Method of Chinese Wrestling. North Atlantic Books. p. 5. ISBN 978-1-55643-609-3. ^ Journal of Asian Martial Arts Volume 16. Via Media Pub. Co., original from Indiana University. 2007. p. 27. ISSN 1057-8358. ^ trans. and ed. Zhang Jue (1994), pp. 367–370, cited after Henning (1999) p. 321 and note 8. ^ Classic of Rites. Chapter 6, Yuèlìng. Line 108. ^ Henning, Stanley E. (Fall 1999). "Academia Encounters the Chinese Martial arts" (PDF). China Review International. 6 (2): 319–332. doi:10.1353/cri.1999.0020. ISSN 1069-5834. ^ Sports & Games in Ancient China (China Spotlight Series). China Books & Periodicals Inc. December 1986. ISBN 0-8351-1534-8. ^ Lao, Cen (April 1997). "The Evolution of T'ai Chi Ch'uan". The International Magazine of T'ai Chi Ch'uan. Wayfarer Publications. 21 (2). ISSN 0730-1049. ^ Dingbo, Wu; Patrick D. Murphy (1994). Handbook of Chinese Popular Culture. Greenwood Press. p. 156. ISBN 0-313-27808-3. ^ Padmore, Penelope (September 2004). "Druken Fist". Black Belt. Active Interest Media: 77. ^ Broughton, Jeffrey L. (1999), The Bodhidharma Anthology: The Earliest Records of Zen, Berkeley: University of California Press, ISBN 0-520-21972-4. p. 8. ^ Canzonieri, Salvatore (February–March 1998). "History of Chinese Martial arts: Jin Dynasty to the Period of Disunity". Han Wei Wushu. 3 (9). ^ Christensen, Matthew B. A Geek in China: Discovering the Land of Alibaba, Bullet Trains and Dim Sum. Tuttle Publishing. p. 40. ISBN 1462918360. ^ Shahar, Meir (2000). "Epigraphy, Buddhist Historiography, and Fighting Monks: The Case of The Shaolin Monastery". Asia Major Third Series. 13 (2): 15–36. ^ Shahar, Meir (December 2001). "Ming-Period Evidence of Shaolin Martial Practice". Harvard Journal of Asiatic Studies. Harvard-Yenching Institute. 61 (2): 359–413. doi:10.2307/3558572. ISSN 0073-0548. JSTOR 3558572. ^ Kansuke, Yamamoto (1994). Heiho Okugisho: The Secret of High Strategy. W.M. Hawley. ISBN 0-910704-92-9. ^ Kim, Sang H. (January 2001). Muyedobotongji: The Comprehensive Illustrated Manual of Martial Arts of Ancient Korea. Turtle Press. ISBN 978-1-880336-53-3. ^ a b c Kennedy, Brian; Elizabeth Guo (2005-11-11). Chinese Martial Arts Training Manuals: A Historical Survey. North Atlantic Books. ISBN 1-55643-557-6. ^ Morris, Andrew (2000). National Skills: Guoshu Martial arts and the Nanjing State, 1928–1937. 2000 AAS Annual Meeting, March 9–12, 2000. San Diego, CA, USA. Retrieved 2008-06-04. ^ Brownell, Susan (1995-08-01). Training the Body for China: sports in the moral order of the people's republic. University of Chicago Press. ISBN 0-226-07646-6. ^ Mangan, J. A.; Fan Hong (2002-09-29). Sport in Asian Society: Past and Present. UK: Routledge. p. 244. ISBN 0-7146-5342-X. ^ Morris, Andrew (2004-09-13). Marrow of the Nation: A History of Sport and Physical Culture in Republican China. University of California Press. ISBN 0-520-24084-7. ^ Amos, Daniel Miles (1986) . Marginality and the Hero's Art: Martial artists in Hong Kong and Guangzhou (Canton). University of California at Los Angeles: University Microfilms International. p. 280. ASIN B00073D66A. Retrieved 2011-12-07. ^ Kraus, Richard Curt (2004-04-28). The Party and the Arty in China: The New Politics of Culture (State and Society in East Asia). Rowman & Littlefield Publishers, Inc. p. 29. ISBN 0-7425-2720-4. ^ Bin, Wu; Li Xingdong; Yu Gongbao (1995-01-01). Essentials of Chinese Wushu. Beijing: Foreign Languages Press. ISBN 7-119-01477-3. ^ Zhang, Wei; Tan Xiujun (1994). "Wushu". Handbook of Chinese Popular Culture. Greenwood Publishing Group. pp. 155–168. 9780313278082. ^ Yan, Xing (1995-06-01). Liu Yamin, Xing Yan, ed. Treasure of the Chinese Nation—The Best of Chinese Wushu Shaolin Kung fu (Chinese ed.). China Books & Periodicals. ISBN 7-80024-196-3. ^ Tianji, Li; Du Xilian (1995-01-01). A Guide to Chinese Martial Arts. Foreign Languages Press. ISBN 7-119-01393-9. ^ Liang, Shou-Yu; Wen-Ching Wu (2006-04-01). Kung Fu Elements. The Way of the Dragon Publishing. ISBN 1-889659-32-0. ^ Schmieg, Anthony L. (December 2004). Watching Your Back: Chinese Martial Arts and Traditional Medicine. University of Hawaii Press. ISBN 0-8248-2823-2. ^ a b Hsu, Adam (1998-04-15). The Sword Polisher's Record: The Way of Kung-Fu (1st ed.). Tuttle Publishing. ISBN 0-8048-3138-6. ^ Wong, Kiew Kit (2002-11-15). The Art of Shaolin Kung Fu: The Secrets of Kung Fu for Self-Defense, Health, and Enlightenment. Tuttle Publishing. ISBN 0-8048-3439-3. ^ Kit, Wong Kiew (2002-05-01). The Complete Book of Shaolin: Comprehensive Program for Physical, Emotional, Mental and Spiritual Development. Cosmos Publishing. ISBN 983-40879-1-8. ^ Zhongguo da bai ke quan shu zong bian ji wei yuan hui "Zong suo yin" bian ji wei yuan hui, Zhongguo da bai ke quan shu chu ban she bian ji bu bian (1994). Zhongguo da bai ke quan shu (中国大百科全书总编辑委員会) [Baike zhishi (中国大百科, Chinese Encyclopedia)] (in Chinese). Shanghai:Xin hua shu dian jing xiao. p. 30. ISBN 7-5000-0441-9. ^ Mark, Bow-Sim (1981). Wushu basic training (The Chinese Wushu Research Institute book series). Chinese Wushu Research Institute. ASIN B00070I1FE. ^ Wu, Raymond (2007-03-20). Fundamentals of High Performance Wushu: Taolu Jumps and Spins. Lulu.com. ISBN 1-4303-1820-1. ^ Jwing-Ming, Yang (1998-06-25). Qigong for Health & Martial Arts, Second Edition: Exercises and Meditation (Qigong, Health and Healing) (2 ed.). YMAA Publication Center. ISBN 1-886969-57-4. ^ Raposa, Michael L. (November 2003). Meditation & the Martial Arts (Studies in Rel & Culture). University of Virginia Press. ISBN 0-8139-2238-0. ^ Ernst, Edzard; Simon Singh (2009). Trick or treatment: The undeniable facts about alternative medicine. W. W. Norton & Company. ISBN 978-0393337785. ^ Cohen, Kenneth S. (1997). The Way Of Qigong: The Art And Science Of Chinese Energy Healing. Ballantine. ISBN 0-345-42109-4. ^ Montaigue, Erle; Wally Simpson (March 1997). The Main Meridians (Encyclopedia Of Dim-Mak). Paladin Press. ISBN 1-58160-537-4. ^ Yang, Jwing-Ming (1999-06-25). Ancient Chinese Weapons, Second Edition: The Martial Arts Guide. YMAA Publication Center. ISBN 1-886969-67-1. ^ Wang, Ju-Rong; Wen-Ching Wu (2006-06-13). Sword Imperatives—Mastering the Kung Fu and Tai Chi Sword. The Way of the Dragon Publishing. ISBN 1-889659-25-8. ^ Lo, Man Kam (2001-11-01). Police Kung Fu: The Personal Combat Handbook of the Taiwan National Police. Tuttle Publishing. ISBN 0-8048-3271-4. ^ Shengli, Lu (2006-02-09). Combat Techniques of Taiji, Xingyi, and Bagua: Principles and Practices of Internal Martial Arts. trans. Zhang Yun. Blue Snake Books. ISBN 1-58394-145-2. ^ Hui, Mizhou (July 1996). San Shou Kung Fu Of The Chinese Red Army: Practical Skills And Theory Of Unarmed Combat. Paladin Press. ISBN 0-87364-884-6. ^ Liang, Shou-Yu; Tai D. Ngo (1997-04-25). Chinese Fast Wrestling for Fighting: The Art of San Shou Kuai Jiao Throws, Takedowns, & Ground-Fighting. YMAA Publication Center. ISBN 1-886969-49-3. ^ a b Bolelli, Daniele (2003-02-20). On the Warrior's Path: Philosophy, Fighting, and Martial Arts Mythology. Frog Books. ISBN 1-58394-066-9. ^ Kane, Lawrence A. (2005). The Way of Kata. YMAA Publication Center. p. 56. ISBN 1-59439-058-4. ^ Johnson, Ian; Sue Feng (August 20, 2008). "Inner Peace? Olympic Sport? A Fight Brews". Wall Street Journal. Retrieved 2008-08-22. ^ Fowler, Geoffrey; Juliet Ye (December 14, 2007). "Kung Fu Monks Don't Get a Kick Out of Fighting". Wall Street Journal. Retrieved 2008-08-22. ^ Seabrook, Jamie A. (2003). Martial Arts Revealed. iUniverse. p. 20. ISBN 0-595-28247-4. ^ Verstappe, Stefan (2014-09-04). "Three hidden meanings of Chinese forms". web.archive.org. Retrieved 2019-04-12. ^ Shoude, Xie (1999). International Wushu Competition Routines. Hai Feng Publishing Co., Ltd. ISBN 962-238-153-7. ^ Parry, Richard Lloyd (August 16, 2008). "Kung fu warriors fight for martial art's future". London: Times Online. Retrieved 2008-08-22. ^ Polly, Matthew (2007). American Shaolin: Flying Kicks, Buddhist Monks, and the Legend of Iron Crotch : an Odyssey in the New China. Gotham. ISBN 978-1-59240-262-5. ^ Deng, Ming-dao (1990-12-19). Scholar Warrior: An Introduction to the Tao in Everyday Life (1st ed.). HarperOne. ISBN 0-06-250232-8. ^ Joel Stein (1999-06-14). "ТІМЕ 100: Bruce Lee". Time. Retrieved 2008-06-09. ^ Mroz, Daniel (2012). The Dancing Word: An Embodied Approach to the Preparation of Performers and the Composition of Performances. Rodopi. ISBN 9401200262. ^ Prashad, Vijay (2002-11-18). Everybody Was Kung Fu Fighting: Afro-Asian Connections and the Myth of Cultural Purity. Beacon Press. ISBN 0-8070-5011-3. ^ Kato, M. T. (2007-02-08). From Kung Fu to Hip Hop: Globalization, Revolution, and Popular Culture (Suny Series, Explorations in Postcolonial Studies). State University of New York Press. ISBN 0-7914-6992-1. ^ Denton, Kirk A.; Bruce Fulton; Sharalyn Orbaugh (2003-08-15). "Chapter 87. Martial-Arts Fiction and Jin Yong". In Joshua S. Mostow. The Columbia Companion to Modern East Asian Literature. Columbia University Press. p. 509. ISBN 0-231-11314-5. ^ Cao, Zhenwen (1994). "Chapter 13. Chinese Gallant Fiction". In Dingbo Wu, Patrick D. Murphy. Handbook of Chinese Popular Culture. Greenwood Publishing Group. p. 237. ISBN 0313278083. ^ Mroz, Daniel (July 2009). "From Movement to Action: Martial Arts in the Practice of Devised Physical Theatre". Practice of Devised Physical Theatre, Studies in Theatre and Performance. 29 (2). ^ Mroz, Daniel (2011-04-29). The Dancing Word: An Embodied Approach to the Preparation of Performers and the Composition of Performances. (Consciousness, Literature & the Arts). Rodopi. ISBN 9042033304. ^ Schneiderman, R. M. (2009-05-23). "Contender Shores Up Karate's Reputation Among U.F.C. Fans". The New York Times. Retrieved 2010-01-30. ^ Pilato, Herbie J. (1993-05-15). Kung Fu Book of Caine (1st ed.). Tuttle Publishing. ISBN 0-8048-1826-6. ^ Carradine, David (1993-01-15). Spirit of Shaolin. Tuttle Publishing. ISBN 0-8048-1828-2. ^ a b Chris Friedman, "Kung Fu Influences Aspects of Hip Hop Culture Like Break Dancing"